I’ve been loving all things lilac this spring, so I ordered this short sleeve sweater the day I saw it. Honestly, I’ve never really thought about how to wear a short sleeve sweater until now. I’m from Florida, so sweaters of any sleeve length have never been a huge part of my wardrobe. Needless to say, I was skeptical of this design for multiple reasons– my primary concern being that it’s scorchingly hot, and nobody in their right mind wants to be wearing a sweater, even if it has short sleeves. After trying it on, I have a hard time calling this top a “sweater.” It’s so light. Plus, its vintage-inspired pointelle stitch is surprisingly airy and is made of more-than-breathable cotton. It’s safe to say that pretty much all short sleeve sweaters will be too warm to wear in the dead heat of mid-summer. 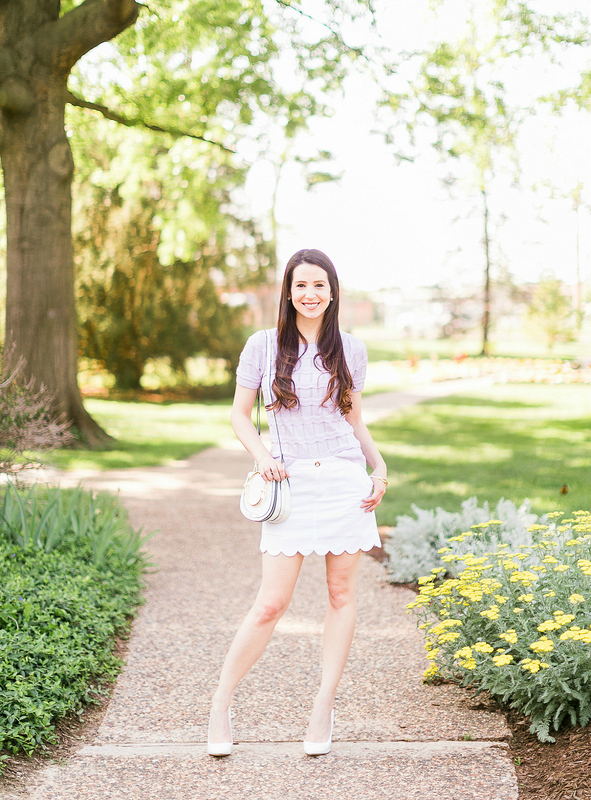 However, as far as the next few weeks are concerned, this preppy lilac number has become one of my favorite spring tops! It’s comfy, classic, and effortlessly easy to style. So far this spring, I’ve worn it with patterned shorts, white denim, dark wash jeans, and, my personal favorite, this Lilly Pulitzer scalloped mini skirt. Oh, and I also have a smaller chest, so I haven’t needed to wear anything underneath. According to some Amazon reviews, you may need to wear a top underneath if you have a bustier figure. That being said, I also love that you can easily throw on a cami, polo, or oxford underneath for added warmth in the colder months, too. Head down to the bottom of this post outfit details! 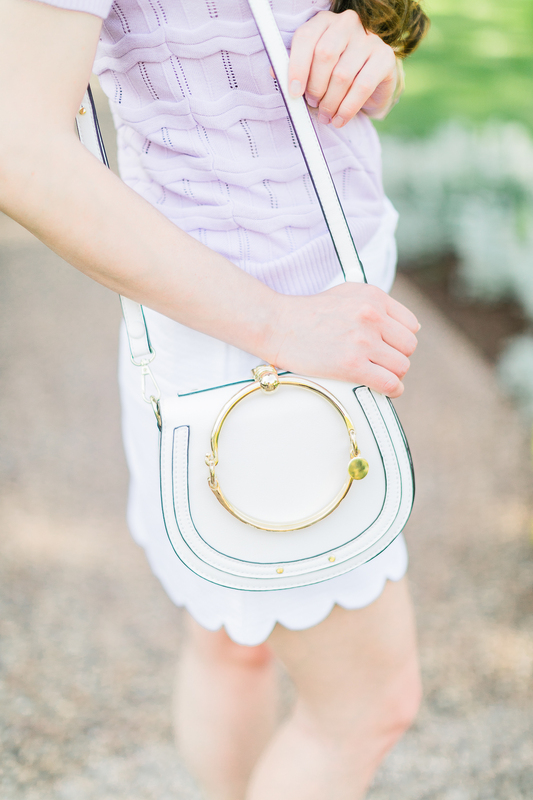 I also wanted to take a minute to brag about this ring bracelet crossbody bag. It looks identical to the nearly $1,700 Chloe Small Nile Leather Crossbody Bag, and you can snag it for under $44 on Amazon. It comes in over a dozen different colors and looks just like the real deal! As always, thanks to the incredible Catherine Rhodes for capturing these images! If you’re in the central Missouri area, she’s the best of the best. Have a great week, y’all!